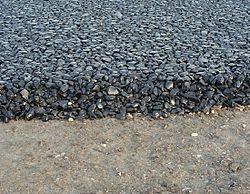 A layer of asphalt concrete paving. Asphalt, or bitumen, is a sticky, black and highly viscous liquid or semi-solid, composed almost entirely of petroleum. It is present in most crude petroleums and in some natural deposits. It is the material which made the La Brea tar pits. Its main use is in road construction. Mixed with "aggregate" (sand, gravel, crushed stone, etc.) it makes a good road surface. It has various other names: pitch, tarmac, blacktop, asphalt concrete, asphalt pavement (US), all mean roughly the same thing. Asphalt which is liquid is often called tar. Tar is also used for plant resin. Solid asphalt is often called pitch. Although a block of asphalt or pitch can look like a solid, it still flows, but very slowly. 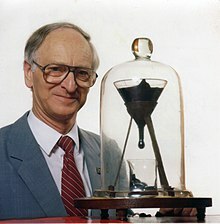 There have been a few "pitch experiments" to see how long it takes for a drip to form and drop off a block of apparently solid pitch. ↑ Holleran, Glynn and Jeffrey Reed. Asphalt emulsions - definition, manufacture and usage; retrieved 2012-4-25. This page was last changed on 27 July 2016, at 15:00.